Continuing on from yesterday’s focus on dementia for World Alzheimer’s Day, we look at some of the poems which work well in Shared Reading groups. Following yesterday’s closer look at how Shared Reading can impact on those living with dementia, we’ve asked a few of our Reader Leaders who deliver groups in care homes and dementia settings to recommend poems which have proved popular in their experience. Helen, an experienced Reader Leader, has found that the flexibility of the Shared Reading model adapts well to dementia settings, giving individuals the opportunity to engage with the literature no matter the stage of their condition or verbal communication. “Part of my role as a Reader Leader is to run Shared Reading groups specifically for people living with dementia. One of the two care home groups I visit each week is made up of residents who are, on the whole, readily able to take part verbally, the other is made up of people at a much later stage in their condition, many of whom have lost speech and are much less responsive. I read between two or three good quality poems in a sessions rather than prose as it seems much harder for people with advanced dementia to hold onto longer narrative passages. The music of poetry also seems to play a great part in its success – often residents will begin to move, nodding or rocking as they’re being read to. The poems vary in terms of what you might call difficulty, it’s not unusual for us to read Shakespeare for example but I generally avoid bringing anything too fragmented. I give every member of the group a large print copy of the poem we’re going to read in case they’re able and willing to follow along themselves. In other Shared Reading settings, Reader Leaders tend to ask open questions to the whole group to stimulate discussion. However, in dementia settings, that method if less effective, so when discussing the poem I use direct, closed questions addressed to a particular individual to help group members hold attention and form responses. This method also ensures that those without obvious communication skills get the opportunity to be asked a question and respond in way available to them: smiling, making movements, eye contact or efforts to talk are all things I have seen which seem to indicate something is happening. He said; “do you remember? If you’re interested in reading with a loved one who is living with dementia or Alzheimer’s, The Reader’s first published anthology A Little, Aloud provides a selection of carefully chosen short extracts and poems designed to be read aloud with someone you care for or those closest to you: a partner, child, sick or elderly relative. The power of Shared Reading is therapeutic, but most of all, enjoyable. Being read to makes us healthier and happier; it stimulates thought and memory and encourages the sharing of ideas and feelings, hopes and fears. 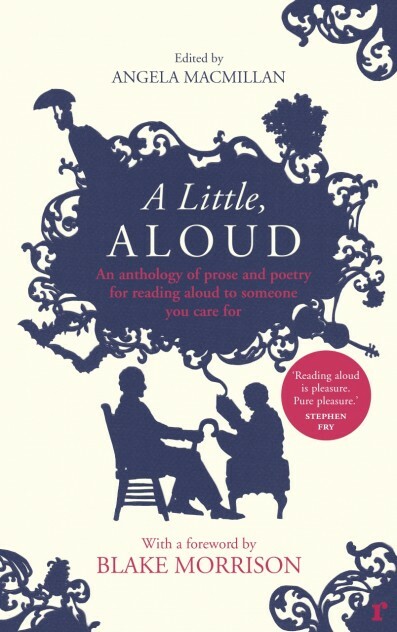 You can purchase a copy of A Little, Aloud here.